This meanders from quaint English folk to Americana with a yorkshire accent to acapella and country. 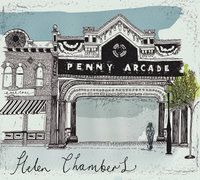 There’s a vulnerability to Helen Chambers voice which adds to the allure. When she sings “keep singing the songs that will stop me from feeling alone” it shows opens up human nature and that is in display on many of the songs here. The acapella duet with Chuck Ragan from Hot Water Music shows both vocalists displaying such frailty. And why wouldn’t they.